While you are in Europe you might want to audition for some international competitions, so, as a special bonus, we have included 42 fax letters to the appropriate international vocal competitions. Additional countries such as Japan are included in this list. Each letter states when you will be in Europe, your return address in Europe and the U.S., and requests an application and/or information about the competition. You may choose to fax ahead of time either from the U.S. or while you are in Europe. In addition, we also have included a table formatted competition booklet similar to the agent/opera house booklets. In this booklet, however, the comment column is filled with pertinent information about the competition, including age limits, deadlines and repertoire requirements. This is a vocabulary list of the most common German business letter vocabulary found in the typical return letter from a German opera house or agent regarding an audition or job opening. 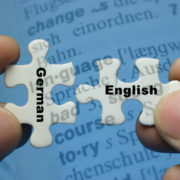 In addition to saving you a lot of time translating response letters, you will be learning the German language.